I was 20 years old and single when I stood at the pulpit of our fundamentalist church and told 200 faithful that I was pregnant. It worked. I was not only forgiven, I was commended for my bravery, for choosing to continue the unplanned pregnancy. I recall feeling a little uneasy with that badge of honor. I had been careless and now, ignorant and unprepared, I would bring a child into the world. I’m glad she couldn’t see my face as I dismissed her sweet sentiment. Whatever, lady. You don’t know my mother. And you don’t know what it’s like to be young and unmarried and pregnant. 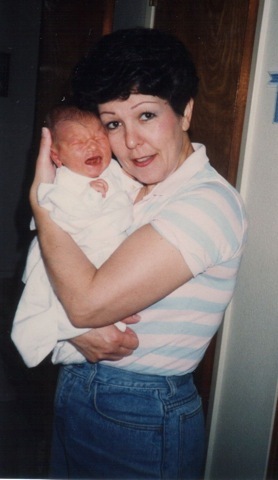 My “mamma” was another face of my grief. She bore her disappointment well, refrained from lecturing and betrayed her disapproval only by the set of her mouth and her unusual quiet. Later I would learn, from one of her officemates, that she cried at her desk for days after I told her I was pregnant. Her stoicism set the tone for the matter-of-fact way we began to prepare for my child. No time to feel sorry for myself; no time for tears. I set my fear aside and braced for motherhood. Mothers-to-be love their children before they are born. Young, terrified, unwed mothers in particular must love their unborn children, because in choosing to continue an unplanned pregnancy, we choose to abort much of the life we had in progress when we conceived. In my case, I dropped out of college and took the first benefitted, full-time job I could find. Forget the degree, forget the future; this child and I needed health insurance. Forget the twenty-year old body; it will change irrevocably. Forget partying with friends. In fact, forget friends—I no longer had anything in common with them. Forget romance, and the boy who loved me like the sun in the sky…now I am a mother, and he does not find mothers appealing. In exchange, I had one beautiful, precious hope. As my belly swelled and I amassed a collection of miniature socks and Onesies, I focused all of myself on the child that would be, and knew that I already loved him. Any mother will tell you that she didn’t know what love was until she had her first child. Nothing prepares you for the enormity of that emotion. When they hand you that bundle of squalling survival, and you stare, awestruck, at the eyelashes, the fingernails, the tiny bud of a person that FORMED INSIDE YOUR BODY, something cracks and a reservoir of feelings you didn’t know you had comes flooding through your psyche, washing away a good bit of your sanity and whatever previous notions you had about love. Those early days with my son were a tilt-a-whirl. The ferocious love was compounded with guilt, inadequacy and fear. I can’t believe I am responsible for this amazing creature. Please, oh please don’t let me screw this up. My mother was a lifeline in the sleep-deprived learning curve of my son’s first few weeks on earth. When colic kept him crying for days on end, she paced the floors with him so I could rest. When he threw up all over me—so much more than he’d taken in, how is that possible? —she took him out of my hysterical grasp and soothed us both. She was supremely capable in all things baby; unflustered, wise. As soon as that thought flittered through my consciousness, I had a shocking revelation: my mother is just like me. A real person. A whole person. NOT JUST A MOM. Honestly, until that moment, in my 20 years on the planet, the thought of my mother as anything other than my mother had never crossed my mind. Here are some things I knew about my mother: when she was a little girl, she wanted to be a nun. In high school, she was elected “Most Studious.” She played on the basketball team. And she met my father, whom she married at age 18. She had my oldest sister at 21, then another baby every two years for the next decade. When her firstborn was almost ready to leave the nest, my mother started over with the birth of her sixth child at age 38. My mother can peel an apple in one unbroken spiral of skin. She scrubs floors on her hands and knees, because she doesn’t believe in mops. She can read your body temperature by placing her cheek on your forehead. She can feed six children and a husband a respectable meal using whatever’s in the fridge at any given time. Here are some things I did not know about my mother: did she have any friends other than those she greeted after church? Friends she could talk to? What did she think about when I wasn’t around? Did she ever have a crush on anyone besides my dad? After the laundry, dishes, and housework, were there things left undone at the end of the day that she wished she had time for? What did she give up when she had us? What dreams were set aside, buried further with the birth of each child? Did she feel ever feel inadequate or incapable? Did she have regrets? Like a curtain had dropped away, I saw her differently from that day forward. I understood what people mean when they refer to “selfless love.” I also understood how utterly self-centered is the nature of childhood. As a child, I saw my mother as perfect; she seemed infallible to me. I was certain that she loved me, but I feared her disappointment more than any punishment. While I deeply respect, even revere, my mother’s capacity for selflessness, I have learned that my love for my children is different. Knowing how very fallible I am, and feeling completely unworthy of motherhood, I have taken a different tack with my kids. I am desperate for my children to know me. Please, see my flaws. Identify with the imperfect human in me, and when you fall, know that I will understand because I fall, too. Hear what I’m thinking? Now tell me what you’re thinking. Let us muddle through this life together; we will help each other figure it out. Nearly twenty years later, I have some evidence of success. My children are good people: flawed, like their mother, but accepting of themselves and others, and open to change. I haven’t always been a great example, but I have demonstrated how to apologize—many, many times. My kids aren’t afraid to talk to me about their lives. They are as open as I can reasonably expect them to be, so I am able to advise and offer perspective in territories that many parents never get to visit. And now, because I’ve watched my own children grow and struggle and make mistakes, I know that nothing hurts a mother like an injury to her child. The hope we have for our children is bigger and brighter than any we ever dared for ourselves—no wonder my mother was crushed when I got pregnant. My pain was her pain. What I perceived as disappointment in me was disappointment for me. But there was joy there, too. She knew then what I know now: ready or not, we survive the initial shock of maternal love and find that, instead of consuming us, it feeds us. It drives us to become better women. It increases the capacity of our hearts, which is why we love our second and third and sixth children with the same intensity as our first. What’s more, it makes us stretchy, resilient, so we can bounce back from hurts and spread ourselves thin and flex into all the different roles we play as mothers. My kids are just 16 and 18 years old. I wish them many rich years before they become parents—years to enjoy, prepare and gather wisdom to use in raising their own children. But I have the big, bright hope that they will become parents someday. I want them to feel that full-to-overflowing feeling when they look at their kids. I want them to know how much their mamma loves them. This entry was posted in Uncategorized and tagged Mother's Day, Motherhood, newborn, unwed mother by midlifemeg. Bookmark the permalink. Love you too! Happy Mother’s Day. I am so grateful for the part you played in raising my kids. Hugs to you and your family. Such a lovely post- bring tears to the eyes. You are amazing!! This is simply beautiful. Thank you for opening your heart and expressing so much in one amazing post. Thank you, Katy. So sweet. I tweeted this post to @HuffPostWomen today (a little post-Mother’s Day tribute, let’s say)!